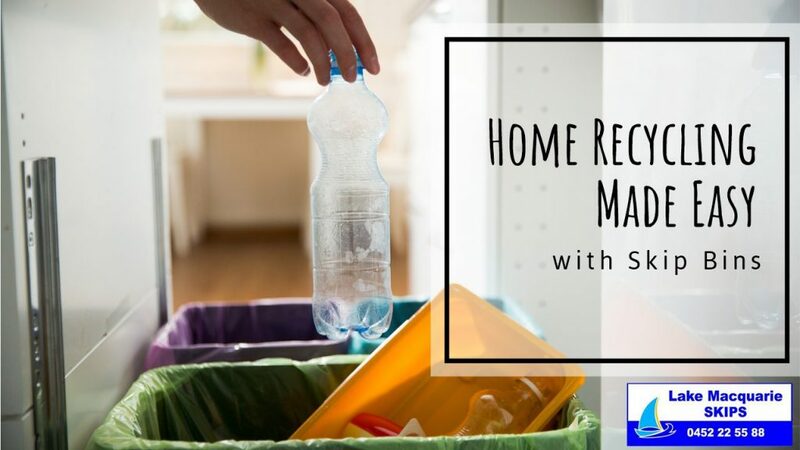 Home recycling can be fun and easy to do, but for many homeowners it can also seem daunting and overwhelming. Luckily, with the help of Lake Macquarie Skips, you can quickly set up a system that works for you. Recycling at home can be confusing. It involves sorting out all of the waste you generate over a week. This includes small items that can easily go inside the bin, to larger items that might have come from a household project or yard clean-up. But recycling also promises a lot of benefits. Recycling at home saves energy, landfill space, and resources. Here are a few ways to make it easy and less confusing. Before anything else, research your local community’s recycling efforts. Know what kinds of rubbish are collected, as well as when collection occurs. You also need to know what types of waste won’t be accepted as recycling material. These details can help you figure out your Lake Macquarie skip bin hire later. Most households go through paper products quickly. Whether it’s in the form of newspapers, packaging or toilet rolls, paper trash can quickly accumulate. To make recycling paper products easier, segregate where you dispose of paper products so that sorting becomes automatic. For example, you can have a separate trash bin for your newspapers. Magazines, printer paper and even phone books can all be sorted together. (Just make sure to remove rubber bands or plastic wraps). Corrugated cardboard has a lot of value in recycling, so be sure to set those aside for collecting. Ask your local recycling centre if they process products such as laminated paper, stickers, plastic-lined paper drink cartons, or carbon paper, as these are quite different from other paper products. Plastic can be easily recycled to produce different types of products. Set aside plastic products such as bottles, grocery bags, and packaging. The number embossed on the bottom of plastic products such as water bottles or laundry detergent containers indicates what type of plastic it is made of. You can check to see if the product can be recycled and be picked up for kerbside collection. Unbroken glass products have value to recycling centres. Glass should be segregated by colour, from clear to green to brown. This includes glass jars, bottles, and vases. Products such as light bulbs, mirrors, Pyrex, and sheet glass should be sorted out separately. Ask your local recycling centre if they accept these. Rinse food cans and aluminium products well before recycling. Other products such as paint cans and aerosol cans are also recyclable, but they are considered hazardous wastes and may not be allowed on a Lake Macquarie skip bin. With a weekly or regular skip bin hire, you don’t need to worry about removing the waste from your home and getting them to a recycling centre. Lake Macquarie skips can handle the transport of rubbish for you. All you have to do to help the environment and the community is sort through your waste as you go through your week. Lake Macquarie Skips makes waste removal easy. With friendly sales staff and reliable drivers on-board, homeowners in the Newcastle, Lake Macquarie, Hunter Valley, Port Stephens, and Central Coast areas don’t need to worry about waste management. Contact us today for a quotation or book a skip bin hire online!